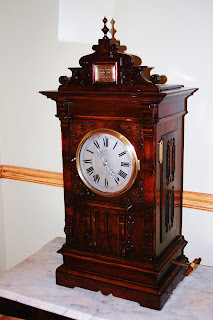 This muscial clock is one of the rarest in my collection. First I will describe the clock and its functions, then speak of its history. This special order Musical Flute Clock was made by Emilian Wehrle during the last quarter of the 19th C. The architectural case is a style # 28 in the 1898 Em. 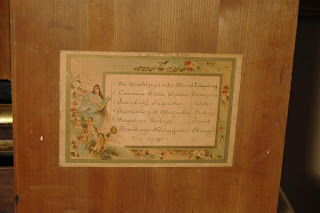 Wehrle and Co. Catalog. This case was available in both Oak or Walnut. This example was made in Walnut. The dial is silvered with a brass high polish locking bezel with glass. The hands on this piece are fantastic silvered hands with cherubs spreading their wings. These hands are the identical hands Wehrle also used on the #33 “Scheffel-Uhr”… Wehrle most elaborate and expensive clock. The Clock movement is a large robust brass movement that will run for 8 days on a single winding. The musical function of the clock is a two tune 8 pipe organ. As the organ plays the large double doors open...and a flute player steps forward. After the Organ is finished playing..the dors close, and large 6 tune music box is activated in the base… this musci box plays one of 6 airs, that change with every activation. The music box fills the whole base of this large flute clock. 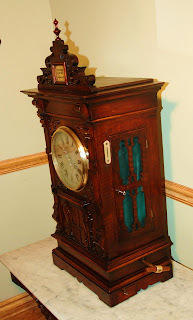 A note worth mentioning, the model # 33 is the only other known Wehrle clock to have a music box. The #33 has a music box that only plays 4 airs and is smaller. When a English Penny is deposited into the brass slot on the upper Right of the case.. 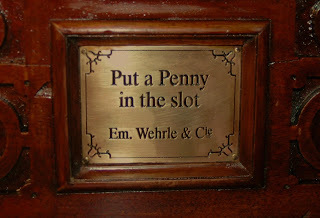 The coin activates the organ where one of two tunes is played, followed by one of Six Airs on the music box. 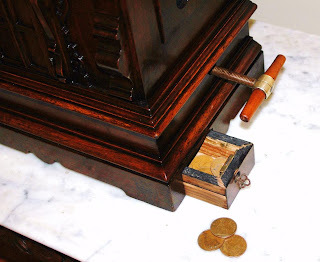 After the music box is finished the Penny is deposited into a locking coin box, that is accessed with a key on the bottom Right of the case. The side doors on this piece are also locking to keep people out of the mechanism. This is the only known Wehrle in existence to have a coin operated feature, and it is 100% factory. Camerer Kuss & Co (Later Camerer Cuss & Co.) Were one of the largest Retailers for Emilian Wehrle, Johann Baptist Beha and many other fine clock makers during the 19th C in the UK. In each of the Camerer Cuss retail outlets, a different coin-operated clock was displayed on the counter. This Wehrle coin operated flute clock with music box was displayed in their Edinburgh, Scotland store. Beha records show this Beha was sold to Camerer and Cuss with coin operation in 1882 for 152 Gold Mark (98 for the clock, 52 for the musical movement and 2 for the coin-op mechanism) This was a very large price for a Beha. It should also be noted that although this clock looks like a #932 in everyway, Beha did not assign it this model # because it was not a normal production clock with the coin mechanism. Unfortunately the Wehrle records were either not recorded or preserved, so information on the price and details of the Kuss flute clock will remain unknown. What we do know is the clock was very expensive, and clearly a special made piece… and very well may be the only coin-operated Wehrle in ever produced. It is quite amazing to think of the thousands of people who “Put A Penny In The Slot” while visiting the shop when these clocks were sold as new. 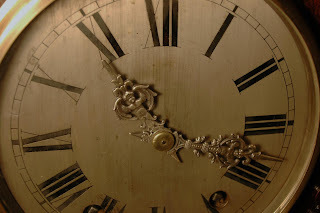 We welcome comments on this clock, and are happy to be able to share this piece with you. 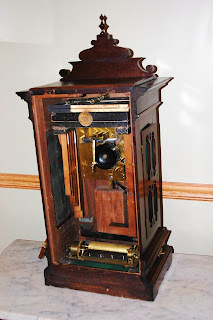 I would also like to take this opportunity to thank Mark Singleton and Dr. Wilhelm Schneider for their assistance with these Coin-operated Cuss Clocks.